During his long tenure as the head of Fox News, two of Roger Ailes’s favorite pastimes were subjecting female employees to grotesque sexual harassment and paying them millions of dollars to keep quiet about it. Once Ailes was ejected from the network (after being fitted for a golden parachute), Fox’s remaining executives were left to wonder: How could Roger afford to pay out so much money in sexual-harassment settlements? Last week, New York’s Gabriel Sherman reported that those executives subsequently discovered that Ailes maintained a sort of black budget, directing portions of the network’s revenues to a variety of personal purposes — including a staff of private detectives tasked with spying on his enemies. BRIAN STELTER: In terms of the money, this is Gabriel Sherman’s reporting in New York magazine. He’s been a leader on this story, wrote a book about Roger Ailes a number of years ago. A lot of what he’s reporting I think reporters have suspected for a while. I’ll give you an example. About ten years ago I had a crush on a woman at Fox News. She was a low level staffer. I was in college at the time. So I was going out on what I thought were dates. Chris, I thought these were dates. These were not dates. She was actually reporting back to Fox News about me. She was reporting back about what I thought of her and about CNN and MSNBC and Fox. Because I was a reporter on the beat, they were actually spying on me that way. Now I didn’t think that was a big deal at the time. I thought it was the way Fox operates. Fox is a political organization. But now we know they were actually sending out private investigators. They were tailing other reporters. 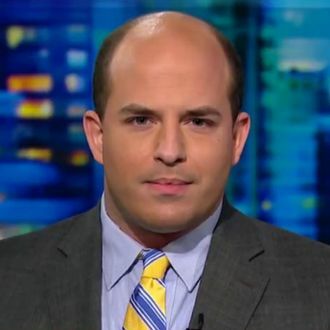 Let’s hope Stelter’s courage will inspire other men who had their hearts shattered by Ailes’s cruel ruses to come forward and share their stories. If you suspect you might be one of those men, Gawker has assembled a list of signs that your significant other is actually a Fox News spy.